What Will Be The Trigger For Commercial Real Estate Cooling Off? By John Sears, National Director of Research and Dominic Brown, Head of Australian and New Zealand Research of Cushman & Wakefield. Australian commercial real estate (CRE) is in hot demand with property yields in many sectors and locations at or near historic lows. Can this continue and what could cause a change in sentiment?Approximately six months ago, Cushman & Wakefield Research noted that the future direction of CRE yields would be influenced by interest rate movements, reviewing three possible scenarios and their potential impact on Australian CRE. These were: 1 negative interest rates and deflation; 2 lower-for-longer; and 3 higher rates and reflation. At the time, we considered Scenario 2 the most realistic scenario with Scenario 1 more likely than Scenario 3. Since then global bond yields have backed up on prospects increased inflation increasing the likelihood of Scenario 3. At the same time Australian CRE yields have continued to compress, reducing the property – bond yield spread and Australian CRE’s relative value proposition. 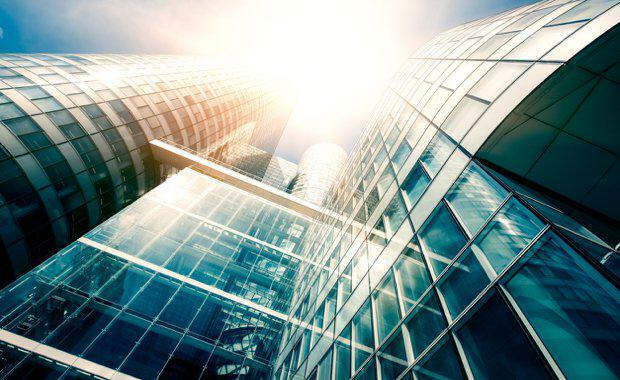 Cushman and Wakefield Research still views the lower-for-longer scenario as the most likely, though the interest rate low may now be behind us and the reduced relative proposition suggests market is becoming more vulnerable to correction. The question is what will be the trigger? Options include: large and rapid increases in interest rates, bond yields and/or corporate debt rates, a sharp reduction in credit availability, a collapse in tenant demand, a geo political crisis or some combination of the above. In Q4 2016, Australian CRE yields in many sectors and locations declined to historic lows. 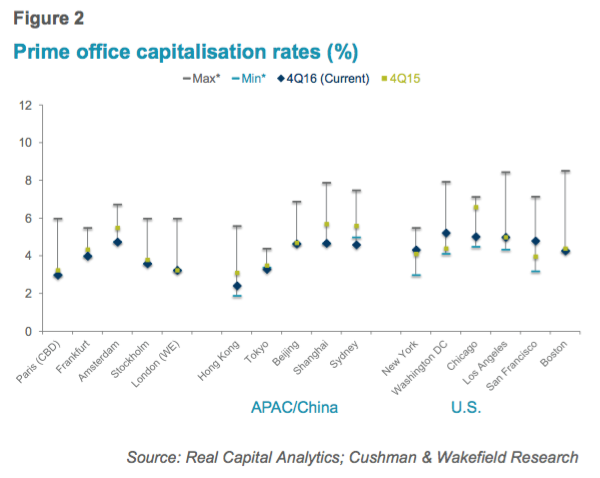 For example, the Sydney CBD office market is arguably the most expensive commercial real estate market in Australia with the average Prime yield just 4.6%. Whilst CRE yields continued to compress, bond yields spiked upwards with the 10 year government bond yield rising about 100 basis points (bps) between August and December 2016 to around 2.8%. Record low CRE yields and the narrowing property – bond yield spread are raising concerns that the top of the current property cycle is approaching. But while relative value is diminishing, the Sydney CBD Prime office property – bond yield spread remains relatively large at around 180 bps and this is helping to maintain demand for Australian CRE. The 2017 Cushman & Wakefield Great Wall of Money report noted that Australia is the world’s sixth most popular destination for CRE investment capital, after the US, China, UK, Japan and Germany. When adjusted for investable market size Australia moves up to second spot, behind Sweden. Reasons for Australia’s attraction include relatively high yields (compared to major global markets), a stable economic outlook and an open and transparent market. While Australian property yields are low compared to history, yields in many international markets are even lower (Figure 2). Relatively strong rental growth expectations are also supporting some Australian CRE markets. For example, Sydney CBD office yields may be near or below the cost of debt but expectations of significant rental growth are driving demand. The improved global economic outlook combined with stronger commodity prices and forecasts of higher inflation have brought Scenario 3 back into play and reduced the likelihood of Scenario 1. But whilst bond yields did move sharply higher in late 2016 they have stabilised and the property – bond yield gap remains relatively high. The following reviews how much further bond yields would need to increase to negatively impact CRE valuations. The impact will depend upon the timing, speed, extent and cause of future increases. 115 bps to return to average: As the property - bond yield spread is relatively wide, indexed bond yields could nearly double (rising by around 115 bps) before the spread returns to its long-term average (Figure 4). This would see the index bond yield increase from around 1.2% to 2.7%, a little below the 2000 to 2010 average of 2.9%. This level of increase, assuming no change to overall economic conditions could have limited impact on CRE yields. 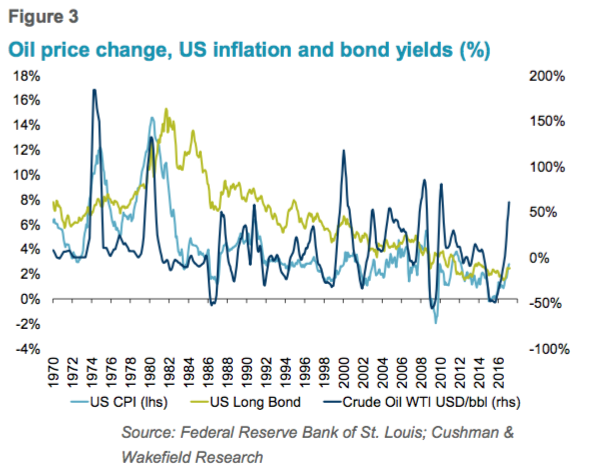 A larger rise in bond yields, could result in the spread moving into what historically might be considered an ‘expensive’ area (Figure 4). This may put upward pressure on CRE yields as investors require a premium to compensate for the additional risk of CRE investment. However, any increase in bond yields would likely accompany improved economic growth and inflation, which may result in stronger rental growth and help to offset the impact of higher bond yields on CRE valuations. To replicate the historic minimum ‘expensive’ spread, the index bond yield would need to increase by 385 bps to around 5.2%. A level it hasn't been at since the mid 1990’s (Figure 4). Unless there is another global economic shock, it appears we have seen the low in bond yields for this cycle, but uncertainties remain. 2 and 10 year government bond yields in both Japan and Germany remain negative and doubts about President Trump’s ability to enact his pro-growth measures are increasing. The Australian 10 year government bond yield, while around 100 bps higher than six months ago, remains well below the average from 2000 to 2015 of 5.0%. In addition, the market, as indicated by the ASX 30 Day Interbank Cash Rate Futures Implied Yield Curve, is implying the cash rate should remain at the record low rate of 1.5% until late 2017 or early 2018. This suggests an alternate version of the ‘lower-for-longer’ scenario is possible. One where interest rates move higher, but at a relatively moderate pace. 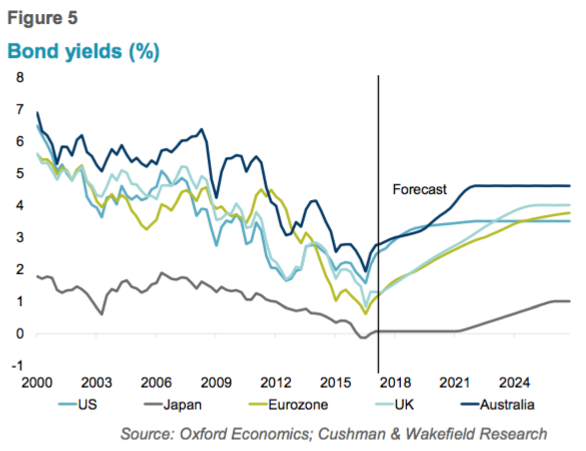 For example, Figure 5 indicates Oxford Economics forecasts 10 year government bond yields to move gradually toward their 2000 - 2015 averages over the next four years, with the Australian 10 year bond yield remaining below 4% until 2021. Ongoing hunt for yield: As noted above, Australian CRE remains is strong demand from global investors and the property - bond yield spread is still relatively high (Figure 1) as is the corporate debt spread with BBB 5 year corporate bonds yielding around 4.0% at the end of February.If bond yields remain low, economic growth continues to be solid and the weight of capital seeking Australian CRE endures, there is a possibility core premium CRE assets, such as premium CBD office buildings or super regional shopping centres, may achieve yields in the low 4% range. A negative property – bond yield spread: A negative 10 year government bond - property yields spread is not necessarily an indication of market overvaluation. 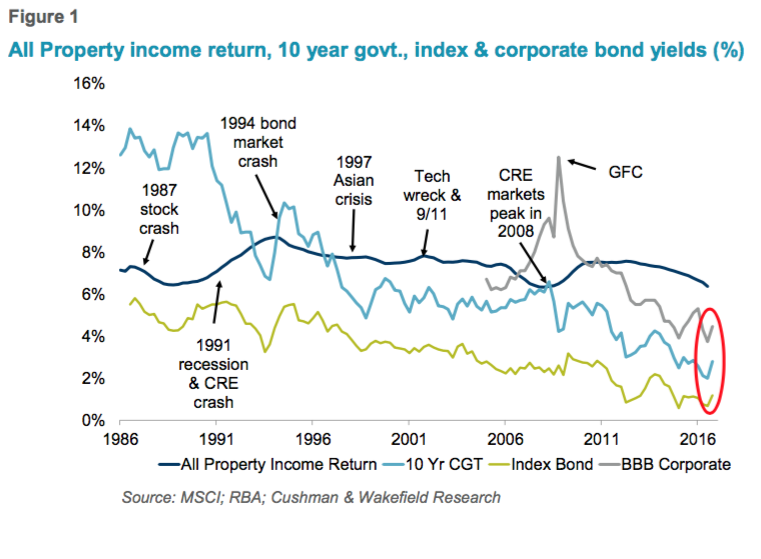 As Figure 1 indicates, in the 1980s and early 1990s and again in 2007 the spread between 10 year government bond yields and property yields for Australian CRE markets was negative. 10 year government bonds are nominal, reflecting inflation trends, and property yields are real as rents generally escalate over the term of the lease. A better comparison is with index bonds (Figure 4). In 2007, CRE yields did not immediately crash when the spread went negative as investors focused on total returns, i.e. income yield plus capital gain. Less resilience: Post GFC, relatively high yields have supported the Australian CRE market despite often weak fundamentals, i.e. soft tenant demand and higher vacancy levels. If 10 year bond yields do rise above CRE yields, it may not immediately signal a correction, though may indicate the market is more vulnerable. The key will be market fundamentals and the outlook for capital gains. A change of strategies: Australian CRE remains in strong demand by international investors, though the relatively low yields may mean return profiles can be stronger for redeveloping existing assets than purchasing assets at market value. As a result, established owners are likely to sell non-core assets and recycle capital into existing assets while active traders are likely to dispose of assets to seek new opportunities. This should provide opportunities for new market entrants. a geo political crisis or some combination of the above. 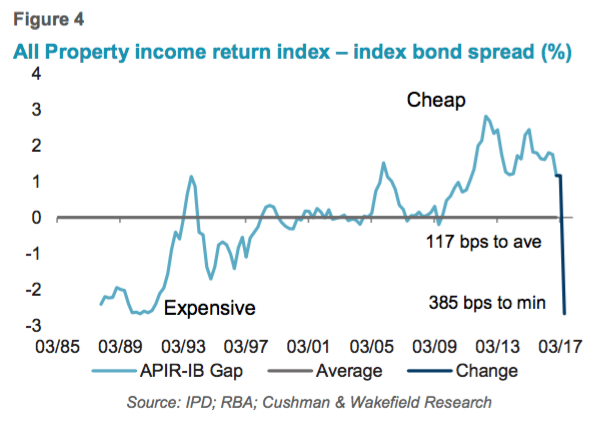 Courtesy Cushman & Wakefield's Australian Property Insights: Relative value revisited Correction triggers?